Congratulations to our next Certificate of the Month recipient, Astrid Pickup, President of the International Yoga Teachers Association! Based in Sydney, Australia, the International Yoga Teachers Association (IYTA) is a non-profit yoga association that provides Yoga Teacher Training and on-going training for members around the World. IYTA is managed by a dedicated group of volunteers who make no personal gain from the work of running the Association and are passionate about yoga and its professional and ethical teaching. As a part of class and workshop completion, IYTA utilizes SimpleCert to manage and distribute completion certificates. 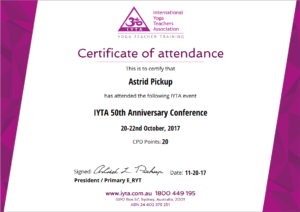 Most recently, IYTA held a 50th Anniversary Yoga Conference in Sydney, and utilized SimpleCert to distribute over 300 Attendance Certificates. IYTA utilizes multiple Certificate Templates (Cert Sets) within their account as a way to further customize the design of their certificates based on Workshop, Membership, and General Attendance certifications. Each Certificate Template honors the brand and design characteristics of IYTA’s website and promotional materials. Astid’s notification emails are also highly customized with logo’s, fonts, and colors – all of which work together to convey an attention to detail and professionalism. Congratulations to Astrid and the staff at the International Yoga Teachers Association for being selected as a winner of the Certificate of the Month Program! They are a textbook example of how to leverage SimpleCert to deliver professional, elegant certifications.